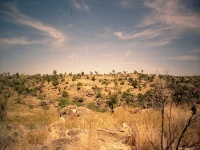 Australia's most famous fossil site, Riversleigh, in northwest Queensland, is a UNESCO World Heritage Site and an extension of the Lawn Hill National Park. It contains the fossil remains of ancient mammals, birds and reptiles of Oligocene and Miocene age, which were found in limestone by freshwater pools, and in caves during the period when the surrounding ecosystem was evolving from rainforest to semi-arid grassland. Most of what is known about the evolution of Australian mammals in the last 30-million years comes from bones found at a single site in the Riversleigh fossil beds, half of which were unearthed in one hour. Species such as primitive koalas and wombats, huge crocodile and large, flightless birds, as well as a range of ancestral thylacines (Tasmanian tigers) were discovered in Riversleigh.